Domesday makes no mention of a church here, but does record that the jurisdiction belonged to Southwell, and that it was a manor of the archbishop. Nearby, Hexgrave Park became an important property of the Archbishops’ of York throughout the medieval period. Indeed, the 958 Southwell charter lists Kirklington as belonging to Southwell ‘with sake and soke’. 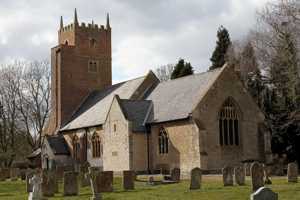 In 1268 one Hugo de Kyrtelington was installed as priest before the feast of St Michael. The value of the church in the 1291 taxation was £5, and had not changed 50 years later at the 1341 taxation. Throughout its medieval history, the church was always closely associated with Southwell. In 1743 there were an average of 60 communicants and over 100 years later, in 1851, there was still an average of 60 in the congregation. The building comprises nave with south porch, chancel with south organ chamber, and west tower. The south doorway is 12th century and it is probable that the core of the nave also dates from this period, though now much restored. The south porch is late 13th century. The west tower, apart from a few lower, medieval stone courses, is of brick and dates from the 17th century, the tower arch being entirely of this period; it is important in that it may date from the early part of that century and is therefore representative of an unusual period for ecclesiastical building. The chancel was entirely rebuilt in 1873-4. (Throsby’s late 18th century description had stated that the chancel was large.) There had been a previous, thorough, restoration in 1847. There is a Norman font with blank intersecting arches. In the organ chamber wall is a simple 12th century lintel or tympanum, almost certainly reset here from the old chancel. The south door appears to have 17th century panels and probably dates from this period. There are three bells in an unusual Elphick ‘O’ form timber frame, two date from 1664 and 1759, whilst the third is a medieval bell dating from the late 14th century by an unknown founder.